It’s official, Chien-Ming Wang is now a Washington National. He’ll join the staff for Spring Training when pitchers and catchers report later this week. Wang is coming off two straight injury years where he had limited playing time, first in 2008 he missed half a season with a foot injury, and in 2009, he had arthroscopic surgery causing him to miss the Yankees’ World Series Run. If you go further back in his career, though, he was 38-13 in 2006-7 with a 3.67 ERA. The Nats are taking a flyer on Wang here, whose post-injury career has been sketchier than a freshman art student’s notebook. They’re trusting that the Nats improved defense will back up a now-fully-recovered Wang. The terms of the deal have not been disclosed, but are guessed to be between $2M and 3M. 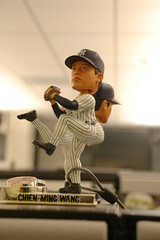 Wang’s Lifetime record is 55-26 with a 4.16 ERA. If he’s close to that sort of statistic in DC, he’ll do just fine.